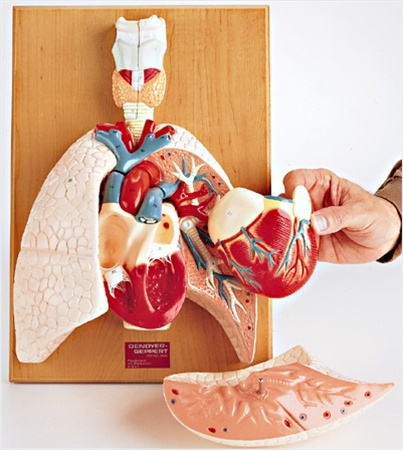 Fully three-dimensional and mounted on hardwood base, this life-size unbreakable plastic model includes lungs, trachea, heart, esophagus, and complete larynx with vocal cords, all in their natural position. The right half of the larynx can be removed, as well as the heart and half of the left lung, which exposes the bifurcation off the trachea and bronchial tree, the pulmonary arteries and veins. The heart itself splits in halves to show its four chambers and valves, thus providing understanding of the directional blood flow there. Pulmonary circulation can also be easily traced, and with major vessels of the systemic circulation depicted, blood flow through the entire body can be demonstrated. 58 numbered structures are identified in the corresponding key. Overall dimensions: 17x11x6 inches (43x28x15cm). And every Autographed Anatomy model carries our Lifetime Guarantee of Satisfaction We will repair or replace any component of any Autographed Anatomy model which proves defective due to our workmanship, for as long as you own the model no charge, of course.